Thank you for such a wonderful blog. It fosters a deeper appreciation for both his work and your words. Thank you for the great blog. It gave a whole lot more meaning to my tattoo of Blue Dog. 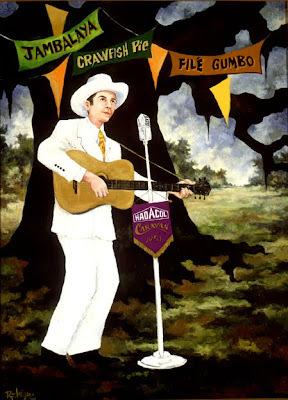 Now I know it likely came from the Bayou Collection and its great to know so much more about the thought behind this great art. I love the blue dog artwork! I find that the blue dog resembles the Pembroke Welsh Corgi. 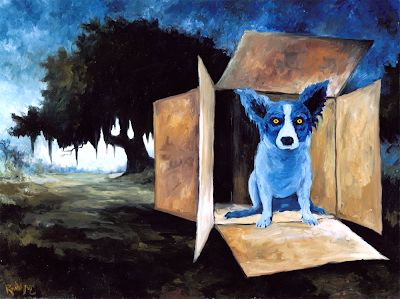 I have 2 corgis and now 4 Blue Dog paintings. Tiffany / Blue Dog looks so much like my kids that the two are almost inter-changeable in my mind. I love them both! Thank you Wendy for provinding the language for us to understand the art! I've been a Blue Dog fan for years. I always see the Blue Dog as an Australian Cattle Dog, or Blue Heeler. Uh, may fit in with the loup-garou idea. i always thought the same thing, especially after getting one of his art books. ACD come in blue, red, and black/white (to my understanding, the black/white coloring is rare for the adults; i've only even seen one.) they can look fierce when they put their dingo face on.i have to say i am surprised "tiffany" was not an ACD. Great read! using his Blue Dog for art class. I love these paintings and really would like to hear more stories about the loup-garou and some of the myths that go along with it. I am so happy you shared the story of the "Blue Dog" beginnings! I think it is awesome and would make a great book! 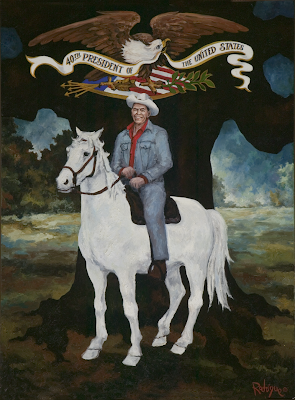 I love George's work and all the attention he has given our wonderful Louisiana! Thank you so much! I love the Blue Dog and have been a fan of Blue Dog art for a long time. She reminds me of a little border collie/spaniel cross I had as a child. Her ears remind me of my current papillon...Felix! I love your blogs...They are my favorite....and I love your husbands "BLUE DOGS". Thank you for the great comments everyone! 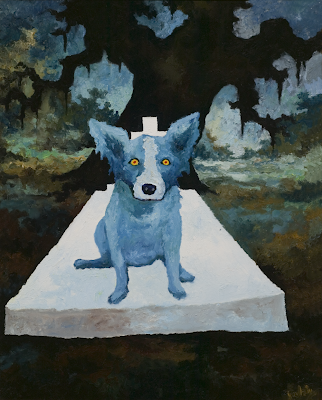 I'm thrilled that you enjoy these posts, providing a bit more insight into the art of George Rodrigue. While looking up the origins of our family name, Dicharry, I found this site. Remembering that the Blue Dog story originally comes from that of the old legend about the loup-garou, this article about the possibilities of our name sidetracked my attention. Thought you might want to read it. So interesting! I wish your paintings could be on display somewhere in Tulsa, OK like the Gilcrease or Philbrook Museums here. We moved from Baton Rouge almost three years ago. We still come back regularly to check on my Mother and miss Louisiana very much. I've always loved your paintings. Hello Wendy and George. Originally from NO, I have enjoyed Blue Dog for many years. 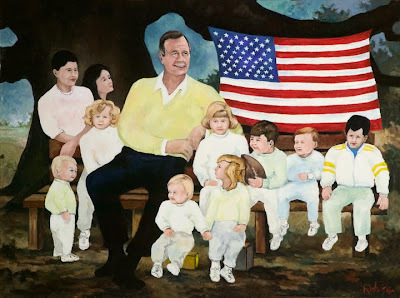 My cousin Pete even commissioned a piece in honor of his father that is displayed at a NO Hospital -love it! Question? Found out my PawPaw was a Traiteur. Do you have any way of contacting one? As I am a Holistic Practitioner, I think this would be valuable information to me, and would love to meet up with one while I am in town. Agreed! Sweet Corgi faces indeed! 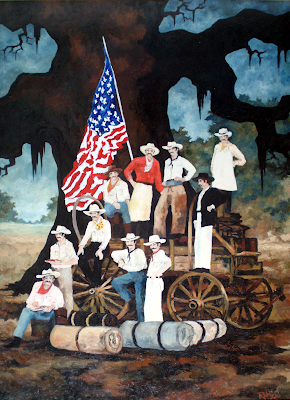 I first saw these paintings driving by the studio while vacationing in Carmel. 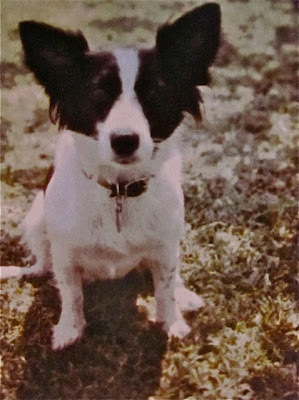 Immediately, I was reminded of the funny, big personality of my Cardigan Welsh Corgi I had growing up. We now have 2 Corgidors- ha. Lab/ Corgis. So in love. Such joyous paintings. The story of Mr. Rodriquez is intriguing. My desire is renewed to have one of these in my home. Thank you.